computer hardware and accounting software Coverage of current tax issues, such as the revision of tax rate structure, new deductions and credits for higher education costs, and taxation of Social Security benefits New test problems throughout to help you gauge your progress, as well as a final exam that can earn you a Certificate of Achievement Complete with a doable study plan, "The McGraw-Hill 36-Hour Accounting Course" is your fast track to easily mastering the essentials of accounting in the shortest time possible. The Balance Sheet-What Good Is It? Does the Balance Sheet Really Show Financial Position? Does the Balance Sheet Actually Show What You Think It May? Why Are Nonmonetary Assets Reported at Cost? What Is the Income Statement's Purpose? What Is Meant, by the Accounting Period? What and Why Are Adjusting Entries? What Can Your Accountants Do for You? What Are Inventory Profits and Holding Gains? What Is Unique about Corporation Accounting? Treasury Stock-What, Why, and How? Stock Splits-What, Why and How? What Is a True Dividend? What Do Accountants Mean by "Reserves"? 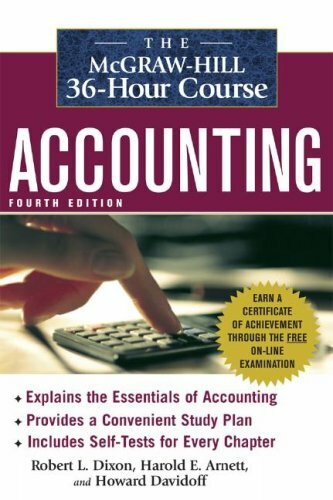 What Are the Purposes of Cost Accounting? Should We Make It or Buy It? What Is a Consolidated Statement? Why Isn't a Consolidated Statement a Combined Statement? Where Are Elimination Entries Recorded? What Conditions Make Interperiod Allocation Necessary?